Hectic schedules and busy lifestyles do not always permit us to opt for conventional exercises at the gym. Here are a few bodyweight/natural/minimal equipment exercises to help you build muscles and stay fit for those times when you cannot make it to the gym. All you need is a little bit of motivation. Yoga has been since ages. People prefer it because along with muscle building, yoga asanas improve mental health as well. Those leading a sedentary lifestyle should consider yoga, as it improves posture and flexibility, and also relaxes the spine. The tree pose, warrior pose, cobra pose, triangle pose, and shoulder stands are best for overall health. Kickboxing is good for developing strength and muscles. It also enhances the potential to deal with everyday problems. People prefer it since it helps shed around 500 calories/hour. A single workout targets your abs, shoulders, arms, thighs, and buttocks. The jab, cross, hook, uppercut, front kick, side kick, bob, weave circle, crunch knee, punch combo, forward leg extension, crescent kick, hook kick are some of the moves you can try. Swimming may not strike as an exercise regime but it boosts metabolism, strengthens muscles, and also helps burn calories. It’s considered to be an ideal workout. Those who swim on a regular basis tend to develop trimmer hips, waist, and lean muscles. Cycling is also a great muscle workout because pedaling involves the workout of major muscle groups. It is not only strengthening, but also improves stamina, metabolism, and enables one to burn more calories. The intensity of cycling, of course is totally left to one’s choice. Jogging is an excellent aerobic workout, since it raises the heart rate and makes fat burning easier and quicker. Oxygen intake increases while jogging, which directly goes into the blood stream and eventually to the muscles. However, the benefits of jogging depend on the speed too. 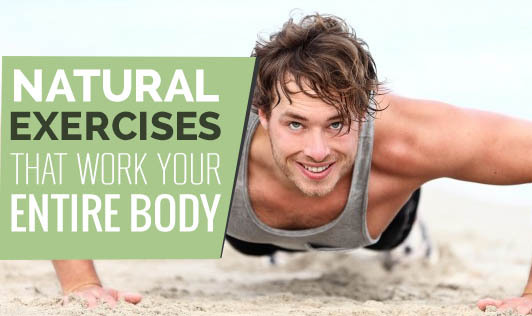 Pushups not only strengthen the muscles of the chest and arms, but also affect the core. To break the monotony of simple pushups, choose freestanding handstand pushups, one-arm pushups, or clap pushups. These are some of the exercises that enable you to build and strengthen muscles without using any gym equipment. It’s not necessary to hit the gym always. Sometimes, we just need to think out of the box to find other possible alternatives.